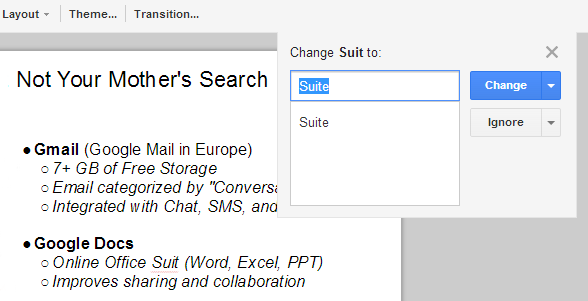 Now it's easier to check the spelling of a Google Docs document or a Google Slides presentation. Just click the Tools menu, select Spelling and review each spelling suggestion. You can click "change", "change all", "ignore" or "add to dictionary". After performing an action, Google locates the next spelling mistake, so you don't have to manually find it. Until now, you had to right-click each spelling mistake and select one of the options. Google Docs flags the mistakes with red underlines, so you can still fix them manually. 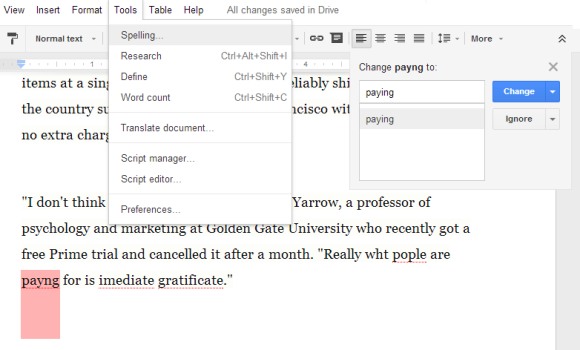 "The updated spell check lets you check the spelling of your entire document or presentation at once, instead of having to resolve misspellings individually," explains Google.